Peel Regional Police are crafting 140-character messages again Wednesday. The service suspended its Twitter account Monday evening after a hacker took control of the account around 9 p.m., tweeting profanities. “What was posted does not represent our service,” said Sgt. Josh Colley. 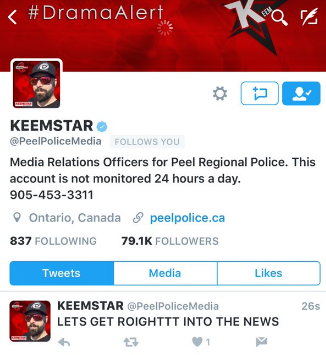 The account name was changed to KEEMSTAR, with the profile photo and background image also altered. A short time later, the account was taken offline. “We’ll be up and running again soon,” said Colley. Officers are expected to resume tweeting on Tuesday; Peel Police have nearly 80,000 followers.